Bicycles are incredibly flexible machines. From the road side it only takes an instant to dismount and mix with the pedestrian crowd. Your bike still works great for carrying heavy bags and unhandy packages. 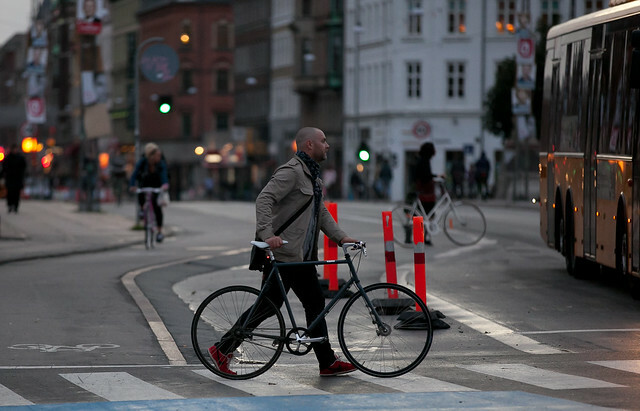 Walking is an effortless addition to our ability to blend into traffic cycle. Its how we can take our bicycles into a closed city yard, a building - or even the city metro. And a well balanced bicycle will almost walk itself. In the photo, 3rd down, (pink paint), the chain looks very slack. Is this just a case of extreme neglect or is there something about this machine that I'm not taking into consideration? George: Pure neglect. That bike is probably only used for (lots of) smallish trips.